The hoof, above, is one of two prosthetics developed by Eric Hinderager of Brownfield’s Prosthetics and Orthotics in Boise. It's been two years since Doro Lohmann met Dolly the donkey, but she still remembers how struck she was by the sheer neglect the small equine had endured. "It made me sick," she said. "I remember thinking, 'How is she still standing up?'" Lohmann and colleague Julie Lawson had just started their Silent Voices Equine Rescue organization when Lohmann went to Richfield to visit a couple who wanted to surrender a donkey. The couple had tried to give up the donkey to a rescue organization in Utah, but no one would take the animal on—with the exception of Lohmann, who volunteered to at least consider it. "I really only raised my hand because I felt so awful," Lohmann said. "Really, the idea was just to go out and look at her and decide if I could take her." But once she saw Dolly, she knew it was impossible to leave her where she was. The donkey was emaciated, with three hooves that were so warped and overgrown that she should not have been able to stand. 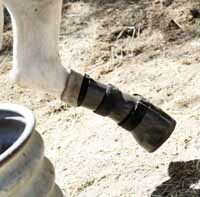 The fourth hoof—and part of Dolly's leg—was gone as the result of an abscess or an infection left untreated. "It literally rotted the hoof off of the bone," Lohmann said. "There was so much pain." Lohmann said the couple never told her how the donkey had lost the hoof or why she had been so neglected. The donkey's leg hadn't even been bandaged, oozing fluid freely. But despite the missing leg and devastating weakness, Lohmann said the donkey seemed to know she was there to help her. "She came over and put her head right on my chest," Lohmann said. "All I could think was, 'I have to get this donkey out of here.'" She did, taking Dolly home to her house on the Board Ranch west of Ketchum and carefully bandaging the stump and trimming the hooves. Not two weeks later, Dolly rewarded Lohmann's efforts with a surprise—a healthy donkey foal, whom Lohmann named Paulina. Lohmann said she believes the baby is the reason for Dolly's survival in the face of immense pain and starvation. "I have no other reason for why she is still standing," Lohmann said. "Everything Dolly had went to that baby." Paulina is reportedly quite a spitfire, with what Lohmann describes as "more personality than most people I know." But Dolly still struggles with recovery, more than two years later. The stump of her hoof alone took more than a year and a half to heal, despite pro bono vet care from Hailey veterinarian Steve Fairbrother and Monte Easterday in Gooding. Now, Dolly has recovered enough to use a prosthetic hoof designed for her by Eric Hinderager of Brownfield's Prosthetics and Orthotics in Boise. Hinderager's wife is a vet, which, Lohmann said, piqued his interest in Dolly's plight. Prosthetics can range up to $15,000, but Hinderager developed two prosthetics free of charge for Dolly, one solid piece she can use now and one more flexible piece she can use when her leg becomes stronger. Dolly's no longer missing a hoof, but Lohmann said the donkey's journey is far from over. Her hip is deformed from limping on three legs for so long, and she's developed bone spurs in her stump. Lohman said the surgery to repair the spurs could cost upwards of $12,000. "The amount of money they're asking is way out of the ballpark," Lohmann said. Even if she could afford it, the surgery would require taking Dolly to Wyoming, a journey she's not sure Dolly could or should endure. The high cost of the surgery plus the sheer amount of medical care Dolly needs is what prompted so many people to turn the donkey down for care, Lohmann said. She still has people who tell her that Dolly should be put down, to which she responds, "Well, Dolly's really happy she doesn't live with you!" And Lohmann hasn't given up hope that people will continue to help her keep this determined donkey happy and healthy. Despite the high cost of surgery and the seemingly never-ending array of medical issues, Lohmann said that for Dolly, everything has a way of working out for the best. "Dolly tends to accumulate miracles," she said.